Joint contractures, or limitations in the full range of movement of joints, are common in older people living in long-term care settings. They result in physical discomfort, social isolation, loss of independence and increased staffing demands. Studies conclude that the prevention of contractures should be the first line of treatment. 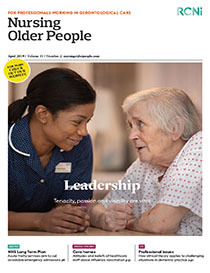 This article aims to raise awareness of contractures in older people living in nursing homes and individualised preventive strategies that can be used by nursing staff such as maintaining functional ability, risk identification, stretching and correct bed and seating position.